Accueil du site > Thèmes de recherche > H.E.S.S. > Dernières nouvelles de H.E.S.S. The γ-ray spectrum of the low-frequency-peaked BL Lac (LBL) object AP Librae is studied, following the discovery of very-high-energy (VHE ; E>100GeV) γ-ray emission up to the TeV range by the H.E.S.S. experiment. This makes AP Librae one of the few VHE emitters of the LBL type. The measured spectrum yields a flux of (8.8±1.5stat±1.8sys)×10−12 cm−2s−1 above 130 GeV and a spectral index of Γ=2.65±0.19stat±0.20sys. 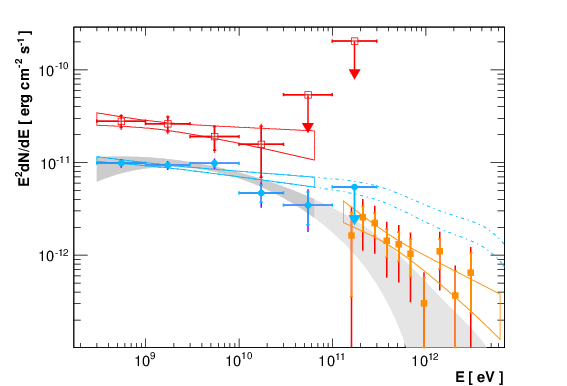 This study also makes use of \textitFermi-LAT, observations in the high energy (HE, E>100 MeV) range, providing the longest continuous light curve (5 years) ever published on this source. 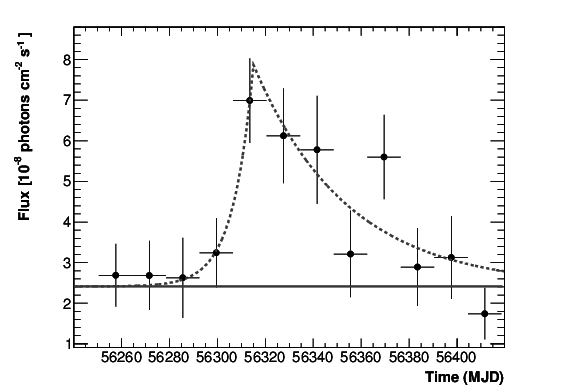 The source underwent a flaring event between MJD 56306-56376 in the HE range, with a flux increase of a factor 3.5 in the 14-day bin light curve and no significant variation in spectral shape with respect to the low-flux state. While the H.E.S.S., and (low state) Fermi-LAT fluxes are in good agreement where they overlap, a spectral curvature between the steep VHE spectrum and the Fermi-LAT, spectrum is observed. The maximum of the γ-ray emission in the spectral energy distribution is located below the GeV energy range.